Mission in style and practical in purpose, our Amish-made Desert Hills Pottery Pantry is a perfect partner for your formal or casual dining room. 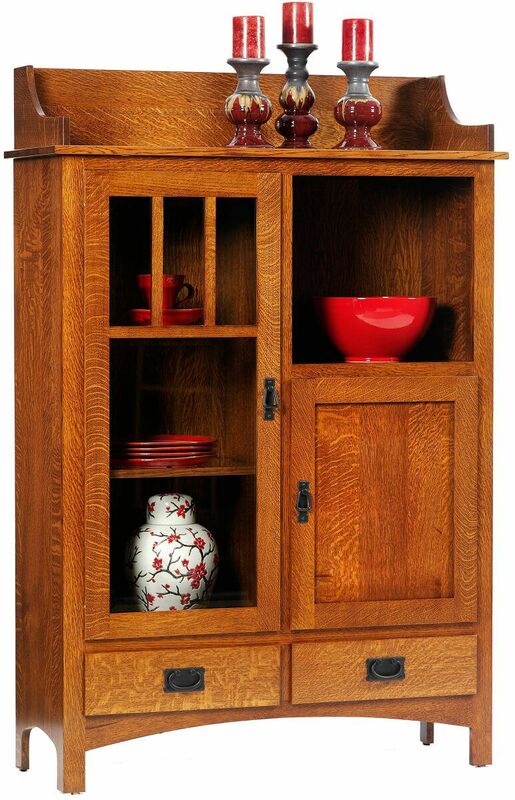 Handmade of solid American hardwoods, this display case is perfect for the kitchen, dining room, or breakfast nook. Two durable dovetailed drawers lie low in your Desert Hills Pottery Pantry, while two doors are equipped with concealed hinges. Display your favorite china or decor pieces within the beveled glass door, which offers glass shelving with hardwood edges. Fluorescent lighting is a standard feature. Design your Desert Hills Pottery Pantry by completing our online Create Your Piece menu. If you prefer the classic Mission look as shown, consider a hand-rubbed Burnished Honey wood finish over Quartersawn White Oak.